Joseph Rinaldo captivated me with his book titled, Hazardous Choices, and was thorough in his portrayal of characters whose life revolves around a gang. 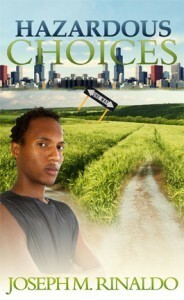 Hazardous Choices was aptly named because, on numerous levels, hazardous choices were made by various characters with Darnell probably making the most hazardous choice of all. In life, we make choices which we’re comfortable with at a given point in time; it doesn’t mean those choices are right or moral. Darnell made a choice to join a gang to avoid getting beaten by the gang every day. He wanted to protect his mother and, in joining the gang, he was protected – but it didn’t mean his mind and soul was at peace. However, Darnell loved football and, because the leader of the gang agreed it would be cool for Darnell to play professionally, he was permitted to go to college and play. During summer break, he returned home – in part to be with his mother but, mostly, he was afraid of what might happen to him if he didn’t continue taking part in gang activities. More was expected of Darnell this time around – with committing murder being at the top of the list – and he knew there was only one way out. Making the most hazardous choice of his life – trying to better himself and escape from the negative influences of his past - Darnell took a gamble with the prize being his life. On numerous levels, Hazardous Choices shows us that, when it comes to being part of a gang, all the parameters are different. It’s not a matter of deciding whether you want to do, or not to do, something; it’s a matter of things being decided for you. It’s a whole new way of life with punishment often taking a deadly turn. Do keep in mind that gangs are made up of people of all races; they may not all hang out in obvious places but may lurk in the shadows. Furthermore, gangs may not take on the appearance you’d expect. They may look respectable as they walk the corridors in school yet catch your son or daughter unaware – then the bullying begins. Gangs don’t have to be 20 or 30 in number; sometimes emotional and physical damage can be done by less than a handful of ruthless individuals who can make your life, or that of your child, a living hell. On a personal note, I’ve never been involved in a gang but I’ve known too many people who have succumbed to the will of others, too afraid of standing up for themselves – too afraid of what might happen if they didn’t say, “yes.” It’s a dangerous place to be when your conscience is in conflict with what has become your reality – when you want to get out but wonder whether it’s even possible. I would strongly encourage teens to read this book, though it’s an eye opener for parents who may wonder whether or not their children are involved in a gang – in which case I would suggest for parents to keep an open mind as they read Hazardous Choices by Joseph Rinaldo. If you are intered in learning more about this book, please click the book cover; it will take you to the book's page on Amaazon.